Affordability is the name of the game with Just Host. The provider's longer-term plans are among the cheapest out there, which makes this a good choice for users who are budget-minded. With hundreds of dollars’ worth of ad credits for Google and Bing available free to new users, plus more than 100 open-source apps available with 1-click installation, this is a generous offering. No matter what stage of the website hosting process you are currently in, this platform has tools and services that could be perfect for you. If you’re at square-one, a great place to start is with Just Host domains, which can be purchased, managed, and transferred with ease. This platform is also a great choice for those who wish to build their website by using the world’s most popular content management system, because on Just Host, WordPress is breeze to install. There are a variety of additional options, too, if you have more specific needs. And although Just Host uptime isn’t guaranteed to a specific percentage, the host does have a team of technicians dedicated to keeping your site online at all times. Just Host's name can be a little misleading. This provider certainly does more than just host. Instead, their core package includes bundles of features, from the real basics to Joomla integration and supported CGI libraries. Bear in mind, Just Host's introductory rates are temptingly low, but after the first term these rates rise a little, though remain cost-competitive. This is a very basic plan for users looking to set up just one site. With 50GB of space and unlimited bandwidth, there's more than enough room to host a website, but this plan offers few bells and whistles. It does come fully equipped with all of Just Host's helpful bits, pieces, and add ons, including one-click installations of WordPress, Joomla, Magento, Oscommerce and more. But to host more than one website or to increase your website space, consider an upgrade, especially if you need more than 500MB of storage in each email inbox. This plan only entitles you to a free $50 of ad credits, rather than the $200 provided with the other plans. Great for the basics, nevertheless. With Just Host you get unmetered bandwidth and a full $150 worth of advertising credits with Google and Bing sweetens the deal, too. With additional spam prevention and Global CDN, this is a mid-priced offering which will give most users the space they need to build something great. If you have greater demands from your Web host, Business Pro offers a well-rounded, competitively priced package. With $200 in marketing credits and all the trimmings--including two SpamExperts, SSL certification, a dedicated IP, privacy protection, and site back-up from SiteBackup Pro--this package is designed to meet the demands of thriving businesses. There are a range of “high end” Just Host hosting packages for users looking for something with more firepower. VPS hosting and dedicated server hosting plans are available, although we recommend discussing your requirements with the provider directly before pulling out your credit card, to ensure this service is the right fit for your more substantial needs. There are many “under the hood” tools that can be added to your Just Host hosting package for an additional fee – or in some cases, as free, open-source software acquired through the platform’s helpful MOJO Marketplace. If your site receives lots of traffic, or if you just want complete control of the software you run, one of Just Host’s dedicated server plans will be perfect for you. The provider offers a good – but limited – range of e-commerce features including Zen Cart Shopping Cart and password-protected directories for better data and customer privacy. There are also marketing tools available for SEO and PPC management. And in case you have a domain with a different registrar, you can use Just Host to transfer domain names with just a few clicks. There have been some reports of occasional downtime at Just Host, but with 24/7 monitoring, this is being addressed. Just Host offers an 30-day money-back guarantee, so if you are unhappy with the service you can simply walk away. If you decide to cancel your plan at any time, Just Host will refund you for the remaining months in your term, excluding setup and domain registration fees. There’s a lot to like about this company, especially when it comes its technological offerings. If you haven’t yet begun the website-building process, you can take advantage of Just Host’s domain registration services to lock down a domain name that’s right for you. Then, after you’ve started creating your site, you can set up your Just Host nameservers to your liking. And if you’re considering selling items on your website, Just Host’s SSH can make your site more secure, while increasing your customers’ peace of mind. Just Host's name can be a little misleading. This provider certainly does more than justhost. Instead, their core package includes bundles of features, from the real basics to Joomla integration and supported CGI libraries. Bear in mind, Just Host's introductory rates are temptingly low, but after the first term these rates rise a little, though remain cost-competitive. This is a very basic plan for users looking to set up just one site. With 50GB of space and unlimited bandwidth, there's more than enough room to host a website, but this plan offers few bells and whistles. It does come fully equipped with all of Just Host's helpful bits, pieces, and add ons including 1-click installations of WordPress, Joomla, Magento, Oscommerce, and more. But to host more than one website or to increase your website space, you'll need to consider an upgrade, especially if you need more than 500MB of storage in each email inbox. If you have greater demands from your Web host, Business Pro and Prime offer a well-rounded, competitively priced package. With all the trimmings including two SpamExperts, SSL certification, a dedicated IP, privacy protection, and site backup from SiteBackup Pro, these packages are designed to meet the demands of thriving businesses. There are a range of “high end” hosting packages for users looking for something with more firepower. VPS hosting and dedicated-server hosting plans are available, although we recommend discussing your requirements with Just Host directly before pulling out your credit card, to ensure this service is the right fit for your more substantial needs. And with all paid plans, if you’re unhappy with your service during the first 30 days, a full Just Host refund is just a phone call away. One of the biggest selling points of this platform is its ease of use. Just Host features an interface that’s not overcomplicated, and provides clear options that ensure you have swift access to the tools and information you need. The software even walks you right through the process of building the site, with tutorials to answer any further questions you might have. And if somehow you still find yourself stumped, the Just Host live chat representatives are available to lend a helping hand. They can even help you setup Just Host SSL to make your site even more secure. When you sign up for an account on this platform, you have plenty of options when it comes to website creation. You can use the Just Host website builder to craft a site yourself, or you can hand your site design over to to the company’s creative team. If you want to build your own site with Just Host, templates are available in a variety of designs and color schemes to match whatever kind of project you’re working on. Or, instead of using the Just Host site builder, you can install WordPress or activate Weebly and design your site with either of those free, easy-to-use drag-and-drop tool. To get started, simply click the add-ons tab in your control panel to explore the available options. This flexible, easy-to-navigate, and customizable system is a great place to build a site for users of all abilities, working on all sorts of projects. Just Host's customer support has received mixed reviews in recent months. There are reports that the formerly US-based call centre has migrated overseas and that this has had an impact on the quality of customer support available. However, it is possible to reach Just Host via email and on their 24/7 freephone number should you run into any trouble. But users should be aware, the support available may not be the best in the industry. Fortunately, there are plenty of helpful resources available on the website and the control panel is impressively easy to navigate. 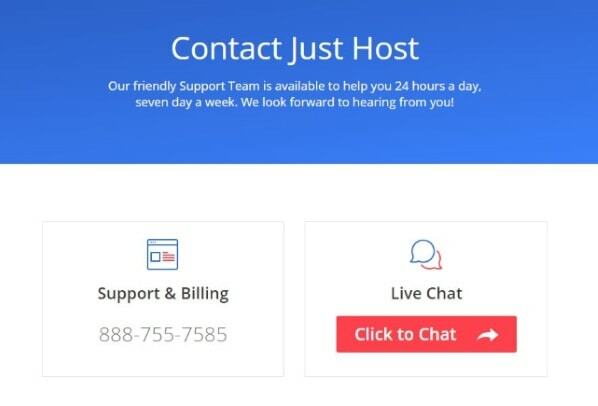 Just Host's customer support has received mixed reviews in recent months. There are reports that the formerly US-based call center has migrated overseas and that this has had an impact on the quality of customer support available. However, Just Host features support via email and a 24/7 phone number should you run into any trouble. Just Host live chat is also available and extraordinarily useful. But users should be aware, the support available may not be the best in the industry. Fortunately, there are plenty of helpful resources available on the website and the control panel is impressively easy to navigate. It’s even relatively simple to get a Just Host SSL certificate, if that’s what you’re looking for. Although Just Host doesn’t offer a free trial of any of its hosting services, the company does have an intuitive drag-and-drop website editor that’s available to use at no charge. In addition, Just Host grants users a complimentary domain name with any hosting package purchased. There’s also a 30-day money-back guarantee with Just Host, so you can test out any of the platform’s services for a full month and get a complete refund if you're not pleased with any aspect of the interface. Experienced webmasters will be happy to hear that the standard cPanel interface is Included with every hosting plan from this provider, whereas the VPS plans come with an enhanced version of the popular program. Simply by using your Just Host cPanel login, you’ll have access to all of the back-end settings, features, and functions that you’ve grown accustomed to using. But even for first-time site managers will find the Just Host control panel easy to use, and with a surprisingly rich feature set. Similar to most other modern Web hosts, this platform invites its customers to try a virtual private server (VPS) for their websites. To meet your needs, Just Host offers four different flavors of VPS plans, one of which will most likely work well for you. The VPS plans provide instant provisioning and fully managed services, with guaranteed server resources to ensure your site is always accessible. These plans additionally allow users to have complete control to the system’s root directory, and they make it easy to manage multiple accounts with a single login. Shared hosting plans are a great choice for most small businesses owners due to their affordable rates, effective services, and ease of use. Just Host’s shared hosting package offers outstanding uptime, unlimted domains, an easy to use control panel, and fres script library. Plus many more features at a relatively meager price. When your business grows beyond the bounds of a shared server, you may wish to take a look at some of the dedicated options offered by this company. By signing up for your own server, you’ll get access to one of Just Host’s dedicated IP addresses along with all of the oomph that comes with hardware exclusively existing to keep your site online. Just Host has three options when it comes to dedicated servers. And depending upon how much power you need, and how much traffic your site receives, you’re almost certain find a plan that satisfies your requirements. As one of the fastest-growing segments in the industry, cloud hosting benefits users by affording them increased scalability and reliability when compared to shared hosting, but still without the high cost that usually comes with dedicated servers. Just Host offers cloud-hosting solutions through a partnership a company called CloudFlare. It’s easy to activate the CloudFlare integration, and before you know it, you’ll be reaping the benefits that cloud hosting has to offer. It only takes a few minutes to set up your Just Host email account and fine tune it to your liking. Once you've established your account username and password, you can use those credentials to access your Just Host webmail inbox from any device with an Internet connection. And if you'd rather use Microsoft Outlook or a similar email client, setting that up doesn't take long either. To start managing your messages today, head on over the Just Host login page and look for the settings menu. If you’re looking for a feature-rich, low-cost Web host solution that's easy to use, Just Host is a good option. Aside from serving your website with Just Host, newsletters are also easy to create and send. And if you get stuck at any point, the Just Host forum can set you straight. However, if you're looking for high-end customer support or 100% uptime, you may want to look elsewhere as far as this Just Host hosting reviewer is concerned.